Heh, I started to ask but I figured if you wanted to do it, you'd do it without asking. That's very nice of you, Protodude. Thanks! Do we even know if Rockman.exe Network Transmission beta discs exist?? Beta builds of games are always made, however are not typically released to the public such as the DASH beta. Someone has to be part of the company to even be able to access them (or sneak one out). I think there's still some hidden source code hidden on one of Capcom's PCs that might still have the Transmission Alpha/Beta build in it. Another thing I thought about that build, is that they might have just changed the camera angle to look like it's played as a free-roaming 3D game. Who knows? 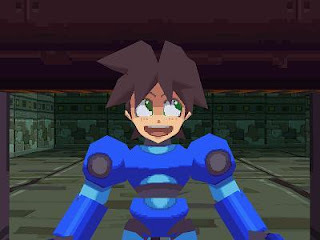 It could be a free-roaming 3D game, or still be 2D static, like say Rockman X8 or even Pandemonium. Ha, sorry about that. Thanks, Vixy!